To me, books are tools. Dust jackets fly off faster than a wedding dress and I usually prefer paperbacks to hardbacks. 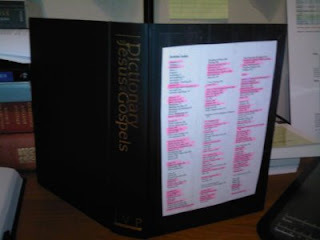 I don't care if my copy outlives me - I just want to get what I need out of it, which is almost always more than what's merely printed on it's pages. Like a hammer, a good book should be made to last a lifetime, maybe two. The ones that manage to keep getting reprinted are probably the only ones that deserve to last for hundreds of years anyway. 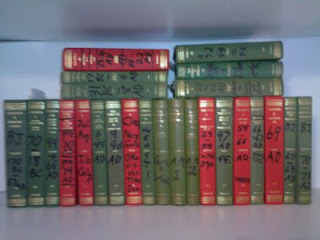 Speaking of which, my Loeb Classical Library editions all have magic marker dates on the spines, too. See? By the way, Jeff Bezos, when the Amazon Kindle has touch screen writing (and highlighting) AND saves my scribbles (with a feature to toggle them on or off), THEN I'll start saving to buy one. Until that happens, I'll never own a kindle. Books are for writing in!